a nonessential amino acid that functions as an inhibitory neurotransmitter in the central nervous system; used as a gastric antacid and dietary supplement, and as a bladder irrigation in transurethral prostatectomy. Called also aminoacetic acid. The simplest amino acid; a major component of gelatin and silk fibroin; used as a nutrient and dietary supplement, and in solution for irrigation; used in the treatment of isovaleric acidemia. /gly·cine/ (G) (Gly) (gli´sēn) a nonessential amino acid occurring as a constituent of proteins and functioning as an inhibitory neurotransmitter in the central nervous system; used as a gastric antacid and dietary supplement, and as a bladder irrigation in transurethral prostatectomy. A sweet-tasting crystalline nonessential amino acid, C2H5NO2, that is the principal amino acid occurring in sugarcane. The simplest amino acid found in protein, it is derived from the alkaline hydrolysis of gelatin and used in biochemical research and medicine. a nonessential amino acid occurring widely as a component of animal and plant proteins. Synthetically produced glycine is used in solutions for irrigation, in the treatment of various muscle diseases, and as an antacid and dietary supplement. It is the only amino acid lacking an R group side chain and therefore also lacking stereochemistry. See also amino acid, protein. The simplest amino acid; a major component of gelatin and silk fibroin; used as a nutrient and dietary supplement, and in solution for irrigation. Fig. 175 Glycine . Molecular structure. one of 20 amino acids common in proteins; although it has a nonpolar ‘R’ structure, it is soluble in water. See Fig. 175 . Glycine is the simplest of all amino acids and has an ISOELECTRIC POINT of 6.0.
n a nonessential amino acid used as an adjunct to therapy for schizophrenia. It may also improve memory; have hepatoprotective, kidney protective, and antitumor effects; and benefit those with 3-phosphoglycerate dehydrogenase deficiency and isovaleric anemia. Precaution is advised for patients taking clozapine. Simplest amino acid; used as a nutrient and dietary supplement. n a nonessential amino acid occurring widely as a component of animal and plant proteins. Synthetically produced glycine is used in solutions for irrigation, in the treatment of various muscle diseases, and as an antacid and dietary supplement. a nonessential amino acid, H2N⋅CH2⋅COOH, occurring as a constituent of proteins and functioning as an inhibitory neurotransmitter in the central nervous system; used as a gastric antacid and dietary supplement, and in the treatment of various myopathies. Called also aminoacetic acid. Abbreviation gly. has been used as a liver function test in cows but not a generally used one. Alignments of Glycine max SACPD deduced amino acid sequences (Fig. As observed in wild oysters, taurine and glycine were the most abundant compounds that accounted for more than 82% of total FAAs in oysters in the control tank for 2 days. 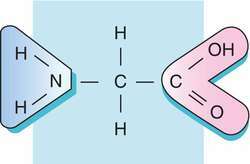 Glycine, or amino acetic acid, is used as a taste enhancer, a buffering agent and a chemical intermediate. These studies have, in various ways, indicated that plants have the capacity to take up some organic N sources, notably the simple amino acids glycine, alanine, glutamic acid, and aspartic acid (e.
We have used a model of plant nutrient uptake that accounts for the supply, soil flux, and root absorption of ammonium ([MATHEMATICAL EXPRESSION NOT REPRODUCIBLE IN ASCII]), nitrate ([MATHEMATICAL EXPRESSION NOT REPRODUCIBLE IN ASCII]), and glycine by an important arctic sedge, Eriophorunt vaginatum L.
As it turned out, glycine was one of the amino acids. 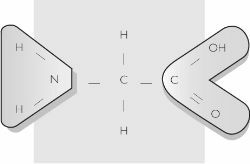 2012, but glycine market does not improve essentially due to severe overcapacity in glycine industry. Change in antioxidant activity, phenolic contents, lipid peroxidation, glycine betaine and proline contents were investigated in fifteen genotypes of wheat differing in salt tolerance. The study was conducted to compare the absorption characteristics of iron glycine chelate (Fe-Gly) and ferrous sulfate (FeSO4) in Caco-2 cells. The researcher has utilized a mixture of citric and glycine fuels in the thermal technique to benefit from the synergy involved.